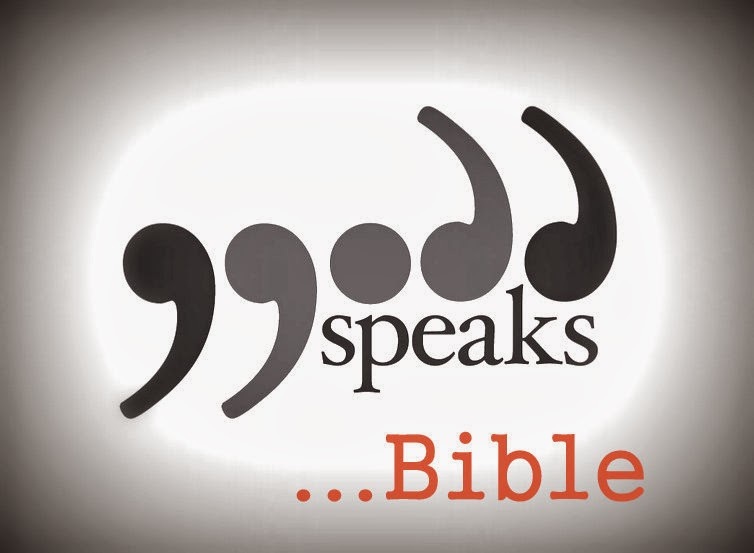 Welcome to the latest part of a series that I'm calling "God Speaks..."
It's not just enough to say that the Bible is the word of God and therefore speaks to us. Of course it does. For me, that goes without saying. But I'm saying more than that, which I'll get to in a moment. As a book, the Bible is fascinating, if you really give it the time to fully look into it. True, for the beginner, it does seem like a challenge to even start to read - where to start? Many think, like with any novel, and start at the front - that's logical, and I certainly have done that. Genesis and even Exodus are actually great story accounts covering huge periods of time - but by the time you get to the book of 1 Chronicles, you will almost certainly stop, if reading it like a book. One book. And of course, in some ways, it is that - but it's also a collection of many books. If you were reading it for the first time, I'd say to actually start much later on, in the New Testament, which is the smaller, second half of the book. Read John's gospel (Matthew, Mark, Luke and John) are the four gospels, and make up the first four books of the NT. The book of John looks at the life and death of Jesus, the central character to the whole Bible. And once you understand that, the Old Testament (OT) makes a lot more sense. Yes, it's a whole collection of a lot of different books - but they all tell the same story - that soon, someone is coming! Of course, we understand who that was from this side of history, but in the time these OT books were written (the last one was still 400 years before Jesus was born), they didn't know when it was about to happen. Let me lay another thing to bed, which often gets said about the Bible, usually from people that haven't read it, or certainly understood it. Having read the book cover to cover several times, and certain parts much more, the book holds together as a whole - it does not contradict itself, it is perfectly understandable, which is how it's meant to read. As a whole, it does communicate the same overall story - that a loving God, who loves us more than we can imagine, had to give his son to die for us, because nothing we could ever do could deal with the separation that existed between us and God - which the Bibles calls sin (which is an archery term for 'missing the mark'). If you fired an arrow, and it didn't hit the target, you'd shout 'sin' to notify people that you'd missed the mark. When we do things that hurt others (not to mention hurting God) we sin - even when it doesn't hurt others, only ourselves, it is still sin. God's plan for us is so amazing, that when we do what (only) our own hearts want, we miss the mark. Anyway, back on to the subject. What I meant by the above was that as a book the Bible is so much more than just ink on paper (or letters on a screen if you are reading your Bible on a tablet!) Because it's inspired by God, it has the power to speak to us. So how has it spoken to me? The above verse was from 2 Chronicles 1:6 and was literally where I pointed to once I'd opened, without looking, onto that page. Unless I was really praying about how many offerings I should make (in which case, I think this would have been quite a challenging word!!) it really isn't much help. It was the encouragement I needed for that moment. What was funny, and totally without my choosing, was whilst playing hockey in England, for my Cheshire based team, my two shirt numbers were first 13, then 31....It's as if God was reminding me of what He'd spoken to me that day, as I made the move to Manchester, and ahead of future moves overseas. To Timothy, my dear son. Here I was, processing that same calling, reading that the people God had called me to for salvation, again were listed here as having deserted God! I identify a lot with 'young' Timothy, and though not as young now as I once was, always took encouragement from Paul's letters to that young leader. So, how has the Bible spoken to you? Maybe you are new to it - I encourage you, to talk with someone about it, maybe read it with someone from time to time that can explain what is coming up. If you are stuck with where to start, read John, or read Luke and then Acts. Both those two books were written by a doctor named Luke, and give an account firstly of the life of Jesus, and then following his resurrection, the life of the early church. It's a fascinating adventure story - but better than that, it's true! And years later, it's as true and helpful today as it's ever been! Thanks for reading - this series will continue next with how God speaks through Words.